Back to phone photos for this post. Whomp whomp. It’s ok. It's been hard to blog still. I'm fragmented into… simultaneous: intense-brokenness and newfound wholeness. And they are so extreme in their differences that each feels like a lie to write. But when left unwritten, oh how real they are. I'm not going to try to write much about that. But know that it's there and shades every bit of what I do write. We hosted Thanksgiving at our house this year. I decided somewhat last minute that: for a Food holiday, considering having food allergies, Thanksgiving at home really is the right choice. It's always such a hard call for me-- choices involving our allergy issues-- because it's uncharted territory. I have very few people to look to on this stuff. 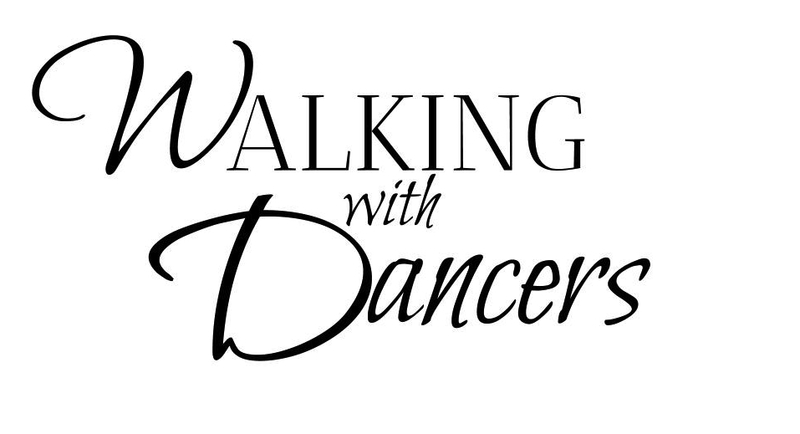 And I don't have the guideposts in life I thought I would on traditions and choices connected to gathering. (Gathering for humans, 99% of the time involves food. And it's not something I noted about life, until it implied danger, then it became a very heavy cross to bear.) I want my kids to come out as whole as possible and not living in fear, but I'd need to keep them alive to accomplish that, and that requires a intense respect for our food limitations. I have made Thanksgiving elsewhere work, but the physical and emotional effort involved does not leave me feeling anything like thankful. I weighed out a lot on: what parts, are of what value to my kids. And while I felt I could force something different because each way has pros and cons -- staying home (at least this year) felt right. Or as right as it gets inside, this space where I can always be wrong. So we had my parents, as well as a few people that Blake works with at the university --- who either don't have family nearby or are international and would like to experience an American Thanksgiving. I've never hosted at Thanksgiving so I was mildly concerned that when it came down to it I'd have a table full of people, but not full of food. So Blake and I made a list of everything that needed to be done to get ready (cleaning, shopping, and cooking/baking) and broke it down by day, to spread out the work to doable amounts each day for about a half a week. That worked SO WELL! Everything was preped and ready and went smoothly. We had our own kind of menu with safe foods that we actually like. We did smoked chicken instead of turkey. And we made egg free, dairy free pumpkin pie (which was a super hit with everyone!) and a few more simple things than Thanksgiving dinners I'm used to. And it suited perfectly. We had nice visiting, and good eating, and an emotionally relaxed time. Then afterwards the kids watched "Elf" and our family just kinda spent time together. So I feel good about the choice to stay home. While prepping I decided to make these placemats. 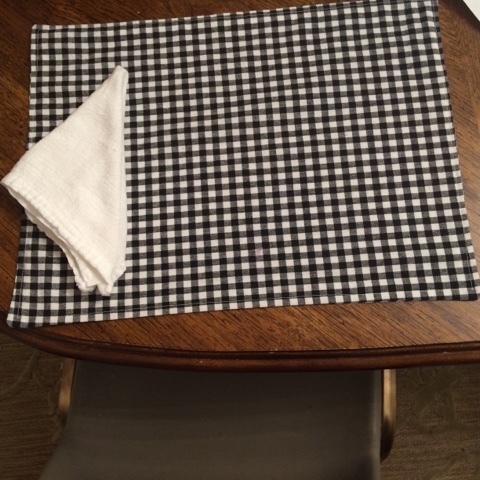 I got bit by the design bug, I saw a picture in Real Simple with a gingham fabric napkin in the mix and couldn't get it out of my head. It was vintage meets modern, and outrageously homey. I fell hard. But I already have white fabric napkins. (I sewed them, a while ago, out of cheap flour sack towels so I'm not afraid of staining them because, once cut up and sewn, the napkins cost less than a quarter a piece. But actually oxiclean has been getting out even tomato sauce.) And so I didn't want more napkin variety. So I went with placemats. I use placemats often anyway to keep extra heat off the table. I think they are so adorable. And so versatile -- they can look so seasonally appropriate in every season! Minimalism-heart be still! Super happy. Well once that placemat utopia happened I was determined to find that same equivalence for Christmas. So I wrote out a list and brainstormed. And the main take away was I wanted simple, quiet, homemade. I thought white and neutral symbolized that well. 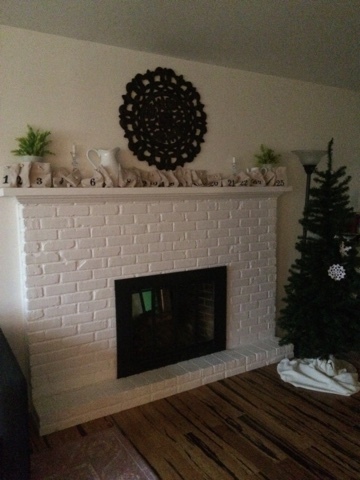 I decided not to get out a lot of our Christmas stuff, and go small and cozy, but lovely. 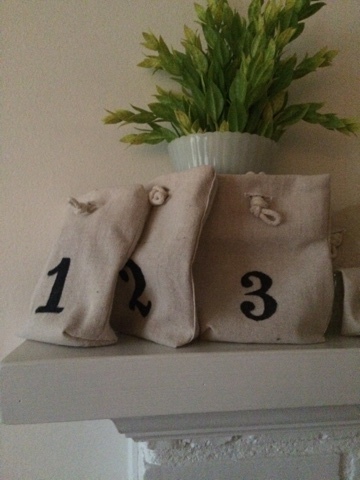 The first thing I did was make advent sacks. A couple years ago I was riddled with emotions on the advent count down because as a kid I would have one of those chocolate calendars and my kids can't have those. I tired that year (brown bags, not fancy numbers, with fruit snacks)and the kids loved it. This year I wanted to make it prettier. Find our real groove. I was riding the Thanksgiving at home wave. I took some fabric that I had on hand, and cut enough rectangles for 25 sacks. I printed out numbers on card stock, traced them in pencil onto the fabric (pre sewing) and then went back with black sharpie and carefully traced and filled in. Then I sewed them into bags. Then I sewed button holes in the front and sew rope that knotted onto the back for closures. I had everything on hand, so they were “free." They were a lot of work(I think it took 3 days/nights worth of free time), but I love them. And they will feel special every year. And I’ll no longer be feeling guilt over how we can’t use the chocolate calendars, because the kids love the fruit snacks and this looks like a real quality thing now. For the tree I decided “Lets just do paper snowflakes” I thought it would be so lovely and I thought it would be a fun project because Jasmine gets the crafting bug as hard as I do. 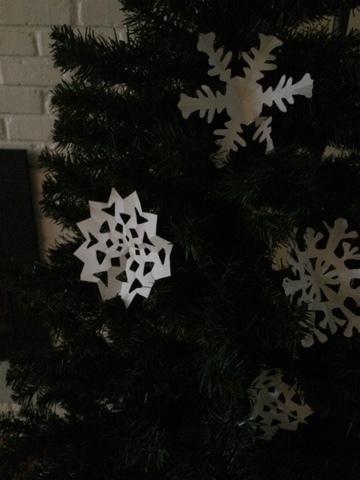 But so far, the kids are kinda intimidated by the snowflake making. I think we need to recalibrate it a bit so they aren’t so intimidated by perfection of it. Or maybe I’ll just do a few more this year and try again next year if it feels right. The tree “skirt” is a cream table cloth I thrifted for super cheap, and I stole some fabric off of it to sew ribbons for my banister. Our tree is in the living room this year because we spend more time in the family room and I didn’t know if Bronny would try to attack the tree or not. So far he’s been very respectful of it. Actually when he woke up from a nap and saw it, he walked into the room and just stopped stunned, pointed and froze in staring wonder. He’s hardly touched it. But I still like it in here. 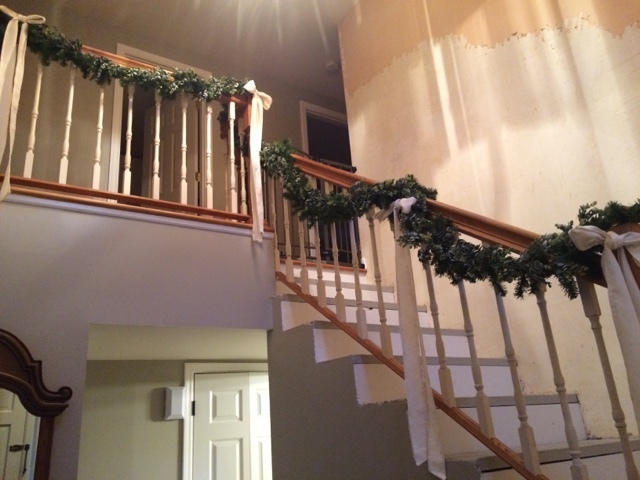 After I put up the garland so carefully on the stairs (which I just love) I suddenly saw the irony of the walls next to it. lol Someday that wall will be beautiful! 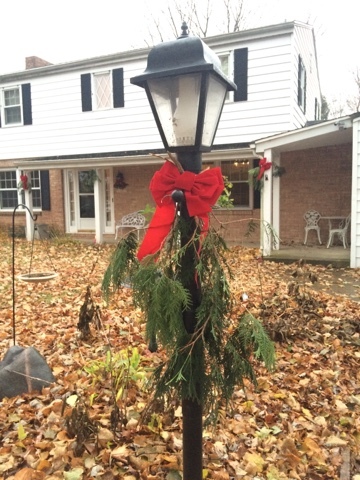 Outside I took some branches (that you won’t miss, because they are from hidden spots) off our backyard evergreens and wired them up with some red bows. I think it’s perfect. Natural, imperfect and real. I’m not completely sure they will stay green until Christmas -- I guess we will see. In the family room. 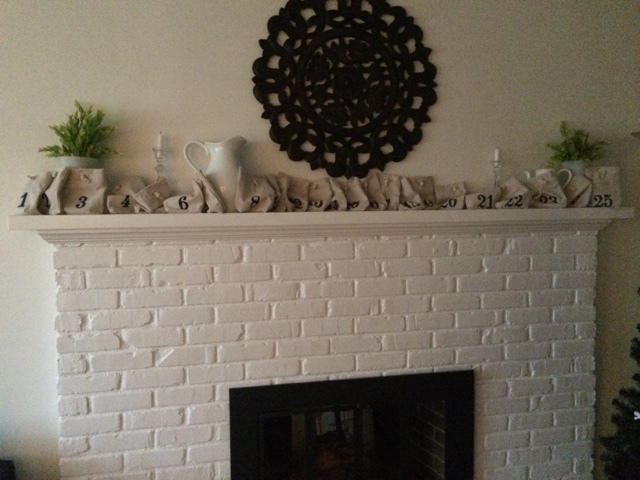 I’ve changed my mantel again and forgot to show you. I think early this fall I got antsy with it and saw this mirror at Goodwill and the rest is history. Still need to add our stockings. 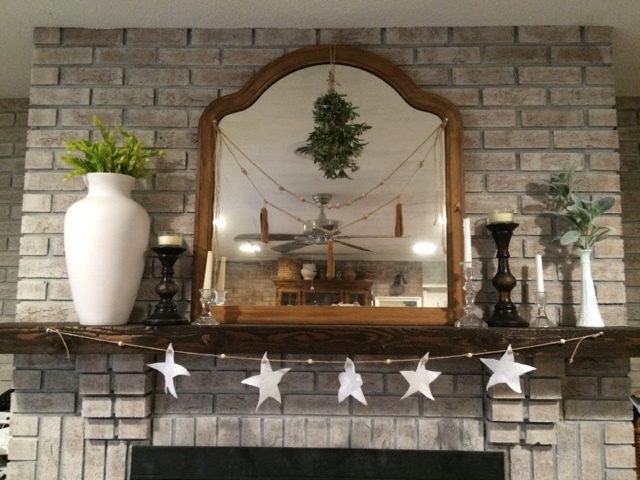 The garland isn’t quite symmetric -- I want to re-string it. But the general idea I love. And Jasmine cut out the felt stars for me in her crafting bonanza. It worked out nicely that we were both crafting fools at the same time -- Other than me needing to constantly provide her with more to keep busy with, while I was trying to stay on task. But we made it. And she’s now old enough to actually help me accomplish what I’m trying to accomplish, not just do busy work. I hope to string some more and put them up a few more places. Lord knows we have a lot of felt stars cut out! I’ve had to buy very little to change our christmas look, and what I did buy I got very cheap. So it feels like what I was going for. Simple and sweet. Before we had these old unattractive, mismatched tiles, and impossible to make look clean, tiles. Oh I should flash back to another reason we never fixed the tile before. The floor drain in here has backed up every time we do laundry since we moved in. 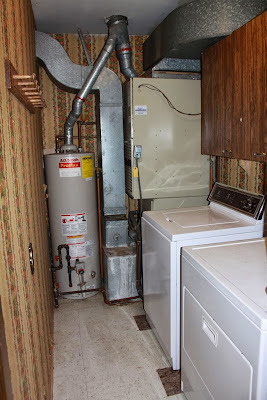 We thought the pipe must be clogged and did all sorts of attempts to fix it, including using a very heavy duty snake and cleaning the roof vents. Nothing helped. Then my dad suggested that the pipe is just too small for the amount of water the washer lets out at once. Which made sense because the house used to have the tiniest capacity washer when we bought it. 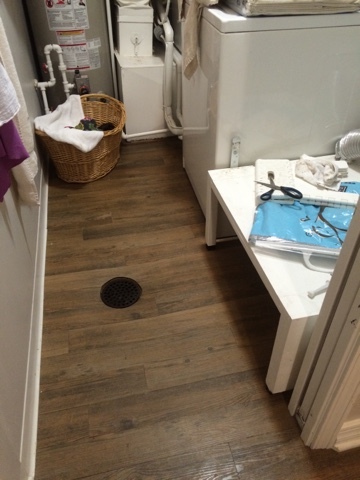 So my dad told us about a part you can put in the floor drain opening to stop the water from coming up, but will let other water go down (under non-washmachine-draining-curcumstances) so we put that in, and no more water on the floor! 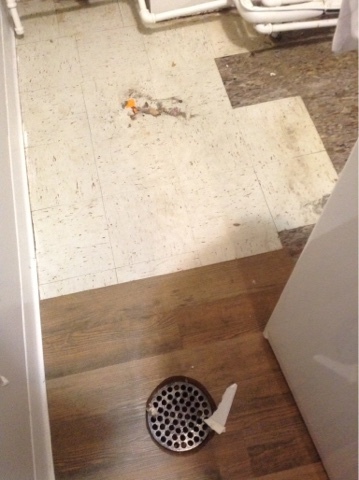 So now we won’t risk messing up the new tile -- which is just peel and stick stuff. We also bought a new metal floor grate -- the old once was nasty beyond fixing. Just having a fresh one is a major improvement to the room. The room feels magical now! 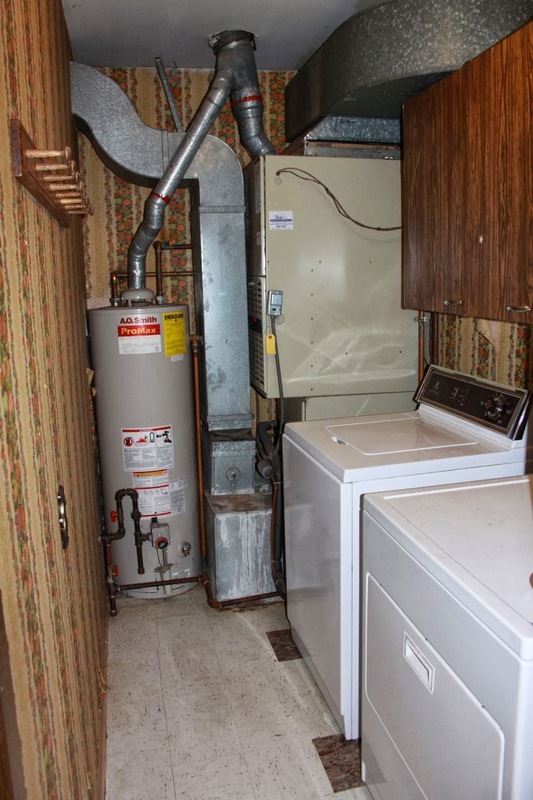 I’ll give you a better after again someday when the dryer is back in. But you get the picture. MAJORLY better. Here are two books that have been a big deal to me. 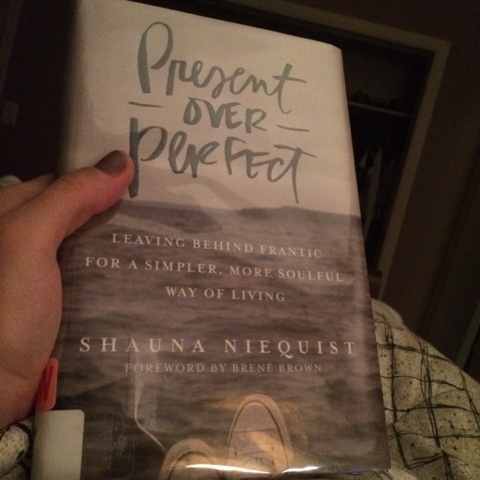 First -- this book came up because of me being in counseling. 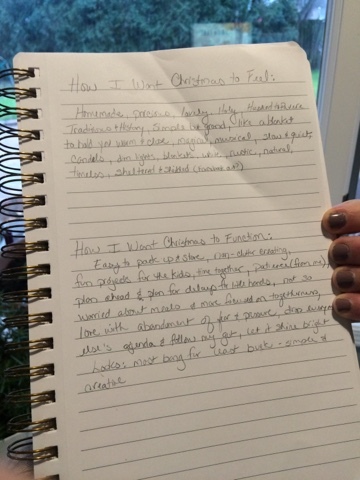 I had been running into one of my kids having some genuinely concerning, impairing, fears. And they were very hard to understand (because they were about very random and “small” things that I would never EVER think of as a fear issue.) 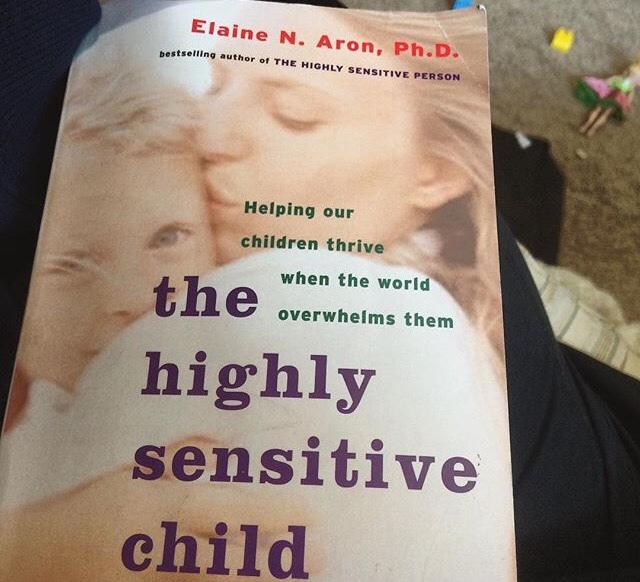 Talking through her personality my counselor suggested she may be a Highly Sensitive Person. So I ordered this book and diligently poured through it for about two weeks. I underlined something on every page. A part that was MAJOR for us was the allowance of anger. There’s a relatively short section on this on page 211. But it’s the biggest help for us right now of anything in there. (Well I mean it all weaves together, but ya know.) Highly Sensitive Children can have a way of feeling like awful people if they have anger, and then do a sort of repression of the anger. They often don’t act out anger. And so on the outside they feel really well behaved, but they are hearing something like “I hate the bad thing that was done to me, I am bad for hating people, I am bad for hating people, I must fight the badness in me. It is so dangerous.” And then suddenly irrational fears of all kinds of things can erupt. And for us it has worked magic. No more outrageous crying fear fits. I’ve been very careful to notice when they are angry, and just stating it for them without judgement. And then expressing things like “yes it is hard when things don’t go our way.” “I feel angry too when that happens." (etc etc -- just validating that it is ok to feel anger.) I know that both, but one in particular child, won’t do much physically with the anger so I’ve stopped throwing in any caveats like “That is hard, but we have to not hurt people with our feelings” -- because she is already so concerned about it, that saying anything along those lines, undoes our progress. And I’ve also tried allowing them to use angry motions, for instance -- one day I could tell they needed to let off some steam so we played karate kick the pillow -- and I cheered them on the harder they went at it. (If you knew my kids, you know know I’m in no way concerned they will do this without me encouraging this -- they are reserved with this stuff. I needed to let them know it’s ok to use their strength ) We all had a blast doing it. And I could tell their hearts got lighter. Overall I'm just really trying to validate their feelings first and foremost, then guiding and correcting later if necessary. And it's making a world of difference in them. "The whole brained child” book that I recommended dove tails into this SO WELL. Anyway -- I was THRILLED to read this book and be more armed for parenting my kids. I was seriously starting to circle the drain for a moment there with the neurotic fears flaring up every 30 mins a day. We are in a MUCH better place after reading this. I’ve been more tired since reading it -- one because I’m suddenly more aware of my own needs again -- time to disconnect and recharge -- and I’m more honed into the sensitivity to noise, which makes my fuse feel sorter since I’m aware of why (HA! life with kids is 100% opposed to this trait of mine --- Thank God my kids are wired more like me so we can kinda find a balance there.) But I think this will level off again. And it’s worth it because I actually have majorly cut down on the scream crying sounds we were living in for a while there. Now my goal is going to be to continue honoring these traits of theirs, without over-pulling-away from life. I think we can do it. But I also know some people will think we are over pulling away because they don’t have the same "need for down time tank" as we do. And I’ll have to come to terms with knowing I know what I’m doing and not doubting so much.